The oldest of the retrieving breeds, the Curly-Coated Retriever is also the most graceful and longest of leg. Its distinct head is clean cut and wedge shaped with a shallow stop, topped with small, close lying ears. Eyes are large and almond shaped, and vary in color from black to amber, depending on coat color. The muzzle tapers gradually, and features a nose with large nostrils, tight lips and a scissors bite. The body conveys power and elegance, with a deep chest, strong level back, and tucked up loin. Feet are compact and round, and the tail is long and fairly straight. The most distinctive feature of the Curly-Coated Retriever is its coat, which is (you guessed it) curly, tight, close, shielding and water resistant; hair on the face, feet and front of forelegs is smooth, short and straight. Coloring is solid black or solid liver. Common Misspellings Curly-Coated Retreiver, Curly-Coted Retriever, or Curlie-Coated Retriever. Some say the Curly reaches adulthood later than other dogs, making it a great choice for a family that wants a dog that can grow up along with its children. The Curly-Coated Retriever enjoys the company of other dogs, pets and children, but may be reserved or aloof around strangers. However, it almost never acts aggressive toward anyone or anything. The Curly-Coated Retriever is perhaps the most independent and least tractable of the retrievers, which can make training a chore at times; counter the dogs occasional bouts of stubbornness with an authoritative voice and clear commands. This is a sensitive breed, and should be trained with patience and compassion never harshness. The dog is quite resistant to cold and moderately resistant to heat, but should nevertheless be allowed to sleep inside since closeness to its family is so important. The coat should be brushed only occasionally, except during shedding season when weekly or biweekly brushing may be necessary. The Curly-Coated Retriever is susceptible to canine hip dysplasia. 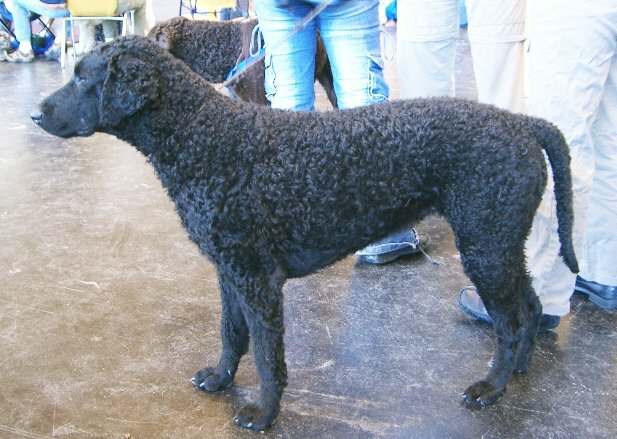 No written account of the development of the breed exists, but experts are fairly confident the dog descends from the Old English Water Dog, Irish Water Spaniel and Newfoundland. Yet another water loving breed, the Poodle, was added to the mix during the 19th century, and served to accentuate the Curly-Coated Retrievers characteristic curly coat.The Curly-Coated Retriever enjoyed its greatest popularity during the mid-19th century, when it was the most widely used retrieving dog in England. Around this time, the dog was introduced to Australia and New Zealand, where it achieved great success as a retriever of California quail and duck. The first Curly-Coated Retriever was brought to America in 1907, and the breed received AKC recognition in 1924. The Curly-Coated Retriever never caught on in America, and its popularity in England fell during the 20th century in England as well; the breed remains a rarity both in the field and the home.